Waves are generated by wind blowing over the sea. The characteristics of waves are determined by the strength of the wind, its duration and fetch (distance a wave travels). The stronger the wind the greater the friction on the surface of the sea and therefore the bigger the wave. 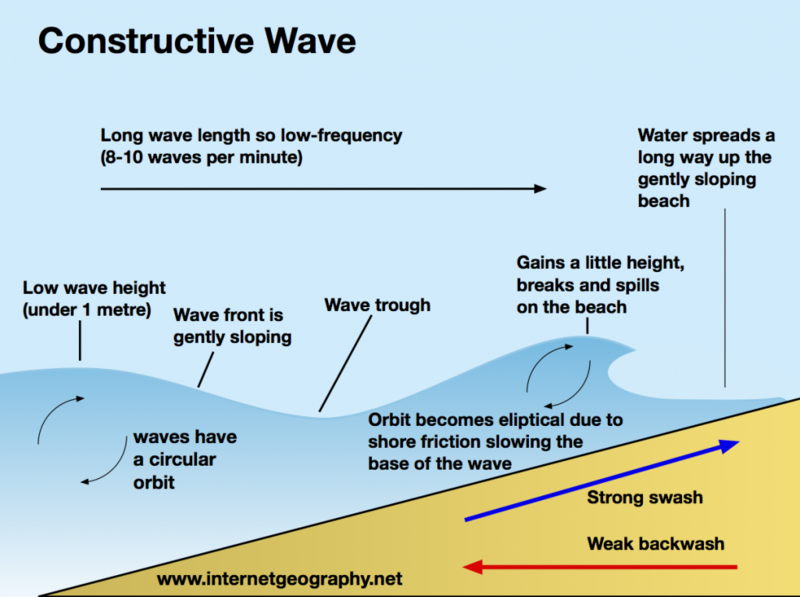 Constructive waves are flat and low in height and have a long wavelength. Their strong swash carries material up the beach, forming a berm. They have a low frequency of between 6 and 8 waves per minute. The wave energy dissipates over a wide area which results in a weak backwash. 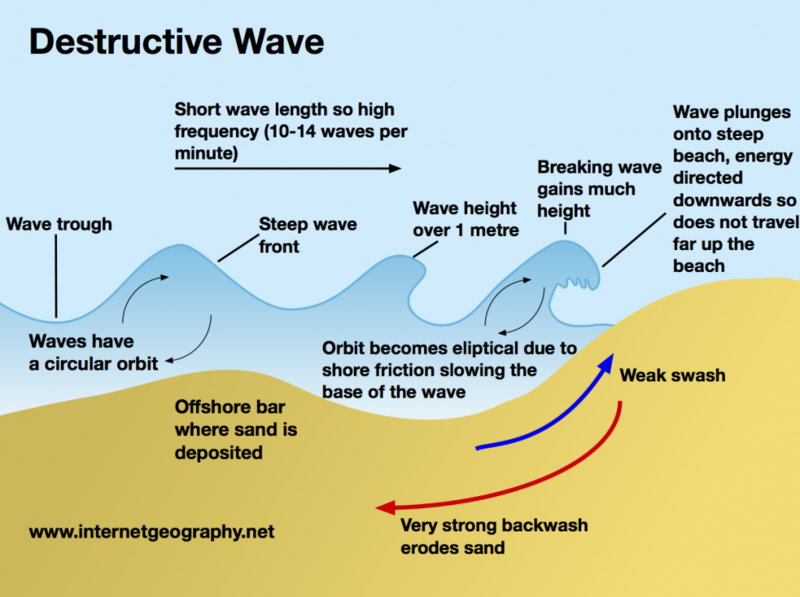 Destructive waves have a large wave height and short wavelength. They have tall breakers that have a high downward force and a strong backwash. Their frequency is high with between 13 and 15 waves per minute. Their strong downward energy helps erode beach material and cliffs. The strong backwash results in narrow beach profiles. 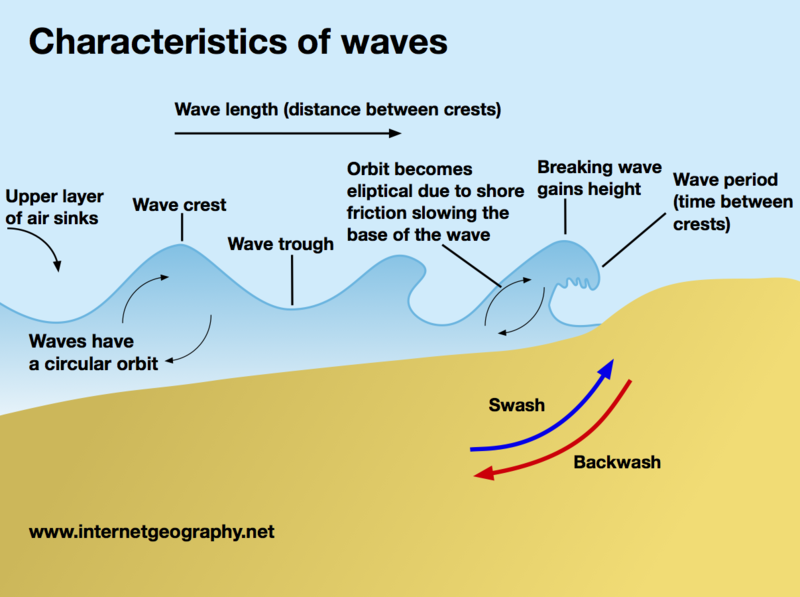 Wave refraction involves waves breaking onto an irregularly shaped coastline, e.g. a headland separated by two bays. Waves drag in the shallow water approaching a headland so the wave becomes high, steep and short. The part of the wave in the deeper water moves forward faster causing the wave to bend. The low-energy wave spills into the bays as most of the wave energy is concentrated on the headland. Tides are the rise and fall of sea levels. 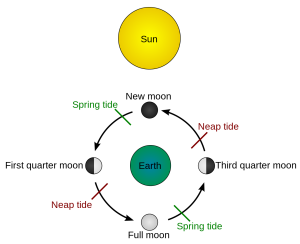 Tides are caused by the gravitational pull of the moon and to a lesser extent the sun. When the earth, the moon and sun are aligned the gravitational pull is at it’s greatest. This creates a Spring tide. A Spring tide results in a high, high tide and low, low tide. This creates a high tidal range (the difference between the highest and lowest tide) and results in stronger tidal currents than normal. 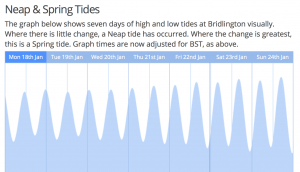 Spring tides usually occur twice a month when there is a full moon. When the sun and moon are at a right angle to the earth we experience Neap tides. The gravitational pull of the sun partially cancels the moon’s. This results in a low, high tide and a high, low tide. This creates a low tidal range and results in weaker tidal currents than normal. 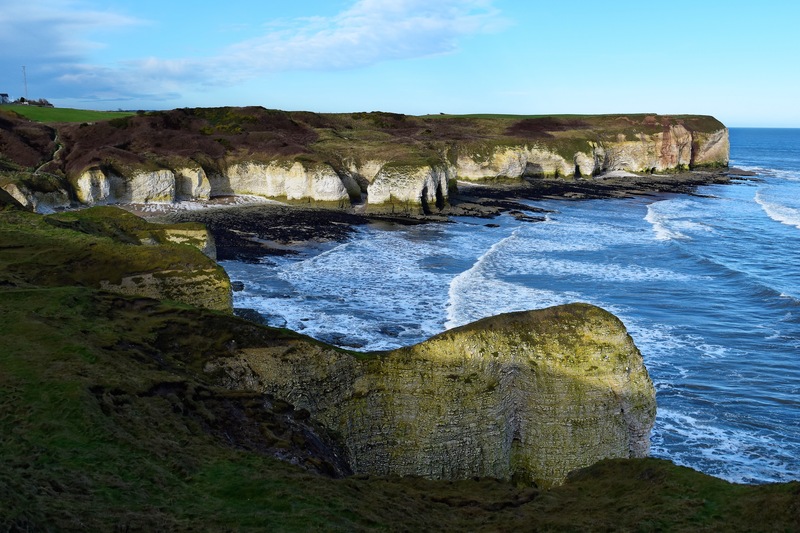 Find out about how coasts are systems.